The following materials can be downloaded as PDFs. If you could like hard copies, email the amount and where you would like them sent to jgallach@ucsc.edu. 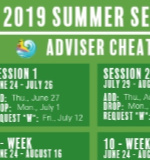 Designed to pin up on your bulletin board and give you the quick Summer Session details you need! A printed version of the online courses page on our website. Remember: If students take classes online, they still have to pay the campus fee. A one-page reference on all dates and deadlines. 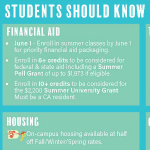 A double-sided postcard you can hand out to students with all the essential Summer Session details including session dates, housing financial aid and tuition details. Promote Summer Session enrollment opening on May 1. Hang it on your public bulletin board, on your door or any high traffic area.